The DITA 1.2 specification uses the content of the unique DITA <shortdesc> element to provide link previews for its readers. These link previews are visually highlighted by a border and a colored background. The link previews are not normative; they contain the content of the <shortdesc> element for the child topic, which is normatively rendered as the first paragraph of the child topic; the content is identical in both renditions. The link previews serve as enhanced navigation aids, enabling readers to more easily locate content. This usability enhancement is one of the ways in which the specification illustrates the capabilities of DITA and exemplifies DITA best practices. 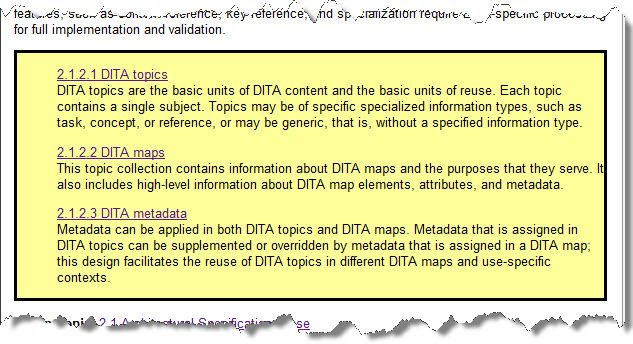 When readers hover over the navigation links, the short description of the DITA topic also is displayed.